"Gregory Tremble "The Trinity" is not 3 Gods it is the One God manifesting Himself in three ways.. His Spirit is as much a part of Him as your spirit is you. His Son also called the Word is Himself manifesting in tangible form. The Father reveals His authority over everything. John 1:1 In the beginning was the Word, and the Word was with God, and the Word was God. John 1:2 He was in the beginning with God. John 1:3 All things were made through Him, and without Him nothing was made that was made. John 1:14 And the Word became flesh and dwelt among us, and we beheld His glory, the glory as of the only begotten of the Father, full of grace and truth. 1st John 5:7 For there are three that bear record in heaven, the Father, the Word, and the Holy Ghost: and these three are one." "And it is very important that we were made in God's image - our purpose is to love him and to be like him. We were not made in the image of some evolutionary ancestor - there's no reason for God to have done that." "Forgive us Father for not taking care of your beautiful creation and serving you with joy and thanksgiving"
"Key words: "us, our" proves the Trinity"
"In the beginning was the Word, and the Word was with God, and the Word was God. The same was in the beginning with God. All things were made by him; and without him was not any thing made that was made. In him was life; and the life was the light of men. John 1:1-4 (KJV) And the WORD was made flesh, and dwelt among us,and His Name Jesus"
"Alx Sosa 1 Corinthians 12 (KJV) Is saying that the Spirit will not lead us to say Jesus is accursed and that the Spirit guides us TO call Him Lord. In context of the chapter it is saying that even though we have different callings as long as its from the Spirit of God it is from God working in all of the body of Christ. 1 Now concerning spiritual gifts, brethren, I would not have you ignorant . 2 Ye know that ye were Gentiles, carried away unto these dumb idols, even as ye were led . 3 Wherefore I give you to understand , that no man speaking by the Spirit of God calleth Jesus accursed: and that no man can say that Jesus is the Lord, but by the Holy Ghost. 4 Now there are diversities of gifts, but the same Spirit. 5 And there are differences of administrations, but the same Lord. 6 And there are diversities of operations, but it is the same God which worketh all in all. 7 But the manifestation of the Spirit is given to every man to profit withal . 8 For to one is given by the Spirit the word of wisdom ; to another the word of knowledge by the same Spirit; 9 To another faith by the same Spirit ; to another the gifts of healing by the same Spirit; 10 To another the working of miracles ; to another prophecy ; to another discerning of spirits ; to another divers kinds of tongues ; to another the interpretation of tongues: 11 But all these worketh that one and the selfsame Spirit, dividing to every man severally as he will . 12 For as the body is one, and hath many members, and all the members of that one body, being many, are one body: so also is Christ. 13 For by one Spirit are we all baptized into one body, whether we be Jews or Gentiles, whether we be bond or free; and have been all made to drink into one Spirit. 14 For the body is not one member, but many. 15 If the foot shall say , Because I am not the hand, I am not of the body; is it therefore not of the body? 16 And if the ear shall say , Because I am not the eye, I am not of the body; is it therefore not of the body? 17 If the whole body were an eye, where were the hearing? If the whole were hearing, where were the smelling? 18 But now hath God set the members every one of them in the body, as it hath pleased him . 19 And if they were all one member, where were the body? 20 But now are they many members, yet but one body. 21 And the eye cannot say unto the hand, I have no need of thee: nor again the head to the feet, I have no need of you. 22 Nay, much more those members of the body, which seem to be more feeble, are necessary: 23 And those members of the body, which we think to be less honourable, upon these we bestow more abundant honour; and our uncomely parts have more abundant comeliness. 24 For our comely parts have no need: but God hath tempered the body together , having given more abundant honour to that part which lacked : 25 That there should be no schism in the body; but that the members should have the same care one for another. 26 And whether one member suffer , all the members suffer with it ; or one member be honoured , all the members rejoice with it . 27 Now ye are the body of Christ, and members in particular. 28 And God hath set some in the church, first apostles, secondarily prophets, thirdly teachers, after that miracles, then gifts of healings, helps, governments, diversities of tongues. 29 Are all apostles? are all prophets? are all teachers? are all workers of miracles? 30 Have all the gifts of healing? do all speak with tongues? do all interpret ? 31 But covet earnestly the best gifts: and yet shew I unto you a more excellent way. The King James Version is in the public domain." "Let "us" make man in our own image!!.... So Jesus was already there with our heavenly father before he created the world,,, so our sweet Jesus is not 2000 yrs old, hey wow, he is billion nd trillion yrs old, nd still going strong, Amen :) :* :)"
"Luke 14 : 11 : " For whosoever exaltes himself, shall be abased ( brought down in some way ) and he that humbles himself ( herself ) shall be exalted. " Just look at one of the " greatest " exalters..... boaster and braggert......... of our day : Mohammed Ali. He now has a serious case of Parkinsons diseases and can barely walk or talk. Fame is WORTHLESS, UNLESS you give ALL the glory and credit to THEE ONE TRUE GOD, ELOHIM, JAH, ADONAI EL SHADDAI in JESUS name!!" "I have overcome satan, th world & its failing system bcz th greater One indwells me. Mine is th most sublime ancestry that ther is, for it is divine. I live in absolute dominion and victory today by the power of th Holy Spirit who lives in me. 1Jn4:4 says "Ye are of God, little children, and have overcome them, bcz greater is he that is in you, than he that is in th world""
"Take note of the word, "let us". That's the evidence of the "Trinity". That Jesus Christ is with the Almighty Father and so with the Holy Spirit, when the world was created!" "Father, Son and Spirit talking in this verse. Jesus was in the beginning with his Father creating the universe. How awesome is that? :)"
"Genesis1:26 when God the Father said this, "let us make a man after their image and likeness". He was referring to Jesus with Him that's why man was made after the perfection of God because the one who made us are perfect or Matthew5:48 said "In a word, you must be made perfect as your Heavenly Father Is Perfect." Amen"
"Humans have made such a mess out something beautiful God created! God forgive us!" "Note that we are not to have dominion over each other. ...black/white....male/female. ..but domonion over fish,animals etc"
"Remember Moses was a prophet of GOD who wrote what he heard,see or the visions he got. Genesis1 v1 and v 2 there is a huge period even other prophets confirmed that Read Job 38 v1-5. It needs an apostle to explain the deep things of GOD thats the new testamend order because an apostle has the direct mind of CHRIST. The son of GOD in John 4v23-24 defined who GOD is and he said GOD IS A SPIRIT. 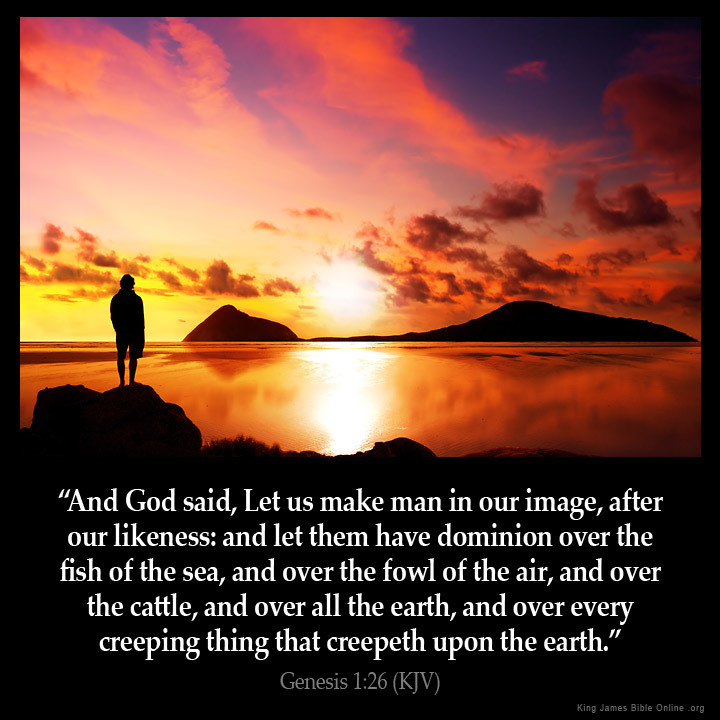 Then the image/likeness of GOD is spiritual the one who was created was a spirit of which in Gen2v7 an earthly-flesh-ground body was formed and the Spiritual man was added through nostrils and Prophet Moses said HE BECAME A LIVING SOUL. There is a deep mystery which Prophet Moses did not write/see 1.What causes chaos/voidness 2.Why did the Spirit of GOD hoovered above the waters 3.Where was the LIGHT/not sun 4.Why GOD said these words 'Let there be.....' and at the end concluded ' it was good' 5.Are literal 6days? Why evening first then morning, Why Apostle Peter put these strong words DONT BE IGNORANT THAT WITH GOD A DAY ITS AS 1000yrs? 6.Who truly GOD WAS TALKING WITH?through the revelation not what you heard 7.Why GOD said earth bring forth animals and he created big fishes?? The answers are with GOD and he reveals them to his children through his WORD because HE PROMISES US THAT HE SHALL WRITE HIS WORD IN OUR HEARTS. JESUS IS NOT GOD HE IS THE SON OF GOD.How can GOD die? How can GOD worship another GOD?How can GOD grow and sleep? Jesus on earth was a selected vessel before the foundation of the earth for GOD to dwell in. Apostle Paul said Apostles,Prophets,Teachers,Pastors and Evengalist were given to give us the KNOWLEDGE OF THE SON OF GOD(Eph4v11,13). If we all believe that what was written the these scriptures are also holy 1st Cor 15v24-28-that Jesus the son of GOD will give GOD his kingdom and Jesus will be our kinsman redeemer/our brother because he also will be a subject to GOD." "When God says, "Let us make man in our image," He is referring to the Trinity....God the Father, God the Son, and God the Holy spirit. Even though Christ had not come to Earth yet, God was still speaking of him in this verse." "Amen! you all have great point, another perfect example of the trinity is, the first few verse of Genesis, when it talks about god creating, the spirit hovered over the water, and the word was with him. Also he spoke the word"
"And that, we, human beings are not animals or the so-called "highest form of animals", as Science is teaching the world, for we were created in the image of God! Amen." "Can you believe that God gave us dominion over all these things and look what we have manage to do with it... No wonder he had to send his son down to earth to die for us and the mess we have made of so much!!! Thank you Lord for all you have done and continue to do - we are so underserving." "Deuteronomy 6:4 Hear, O Israel: The LORD our God is one LORD:"
"Everything was designed to make man in charge here on earth." "Except over woman,she's beside him in everything,not in the lead nor in the rear,but beside him!!!!!!!!!!!!!!!!" "For mankind who was given dominion over the earth, we do not do a good job of stewardship on the earth including all living things. We need to take that verse spiritually and physically.!!!!!! :-)"
"God give a man apportunity to manage animals as well not ruin or abuse it..amen.."
"I believe God left it in our care, to nurture, respect and preserve this precious gift!" "I can't imagine what God thinks about us after He made us in His own imagine. Shame on us"
"In contrast to animals in verses 20 and 24 where GOD said, "Let the waters bring forth" and "Let the earth bring forth," HE now says, "Let US make man in OUR OWN IMAGE, after OUR likeness." All others reproduce after "their kind," but man is the only one made in the image of GOD and reproducing in that image (5:3). The terms image and likeness are used synonymously, and refer primarily to man's Spiritual resemblance (rationally and morally) to his MAKER. (The King James study Bible)"
"Let's never forget that this is not just our bodies but our spirit & mind/soul too. Put on the mind of Christ. Walk in the Spirit. Walk as he, Jesus, walked." "Proof of the triune nature of God"
"Thank God ,am the image of God"
"The meeting of the Three in One; God the Father/God the Son and God the Holy Spirit...! Amen!!" "To get the authority and dominion, we must first walk in covenant relationship with Jesus. See Acts 2:38"
"We,who are in,Christ Jesus,have Dominion in Jesus Christ Authority,in His Name,even to stop the winds+waves,even remove mountains from our path,to trample down the enemy,to raise the dead,to heal the sick,to cast out demons,to gain the Victory over sin, sickness,disease,death,debt,destruction,failure+all defeat,oppression+depression,+all demonic forces+ influences,of the airways ,this world,+the under world+every high+lofty thing,that would try to exalt itself,agains't the True Knowledge,of Jesus Christ our Lord, Who is Greater,Who dwells in us,thru the "New Birth"in Him! GLORY TO GOD ALONE!"" "@ Mr Reed-thats true read also 1st John 1-3. Its good to say what the bible says"
"1 epistle of John Chapter 5 verse 7"
"And that, we, human beings are not animals or the so-called "highest form of animal", as Science is teaching the world, for we were created in the image of God! Amen." "God has given us dominion but at times we act like ones without power"
"GOD is a SPIRIT(John 4v24 and 2Cor 3v17) the 'own' image of GOD (in Gen 1v27)is a spiritual man/the inner person/the real you (Job 32v8,Eph 3v 16,2Cor4v16,) Coming to Gen2v7 is the outerman the covering we have-its body is subjected to corruption/death. The image of GOD is not the face you have is what YOU ARE IN SPIRIT. THERE IS ONE SPIRIT,ONE GOD,ONE LORD....Eph4v4"
"I hope those reading this message realize as Christians, through our faith in Jesus Christ, we even have power over Satan. Through Him, all things are possible." "Jesus was there at the Beginning!" "Jesus was with his father from the beginning"
"Love the Word of GOD...It helps me stay on track for the LORD and stay my sinful self out of trouble." "Luke 12 : 15 : " Take heed ( listen to with care and obey ) and BEWARE of covetousness ( eagerly desirous ) : for a mans ( or wonans ) life consists NOT in the abundance of the things which he possesses."" "Note: it reads our image our likeness which means there were many Godly figures or beings"
"Our: God the father, son and holy spirit." "Proof of the trinity - Father, Son, Holy Spirit. Amen." "Psalma 27 : 4 : " One thing have I desired of the Lord, that will I seek after : that I may dwell in the house of the Lord all the days of my life, to behold the beauty of the Lord, and to inquire in HIS temple. "" "Read every day to live according to the plan of God our creator and Jesus the Christ our personal savior." "That scripture shows there was more then one, but shows more then one. Like Father, Son and the Holy Spirit." "U got it right...KJV the only way!!!" "Um made in God's image,accrdin 2 hs likeness & finally i ws givn dominion ovr evrthn in earth. Fathr thank u! Amen!!!" "... Let us make man in our image, after our likeness... And right after that, God starts talking about lordship, in this case of men. From this very first verses of the Bible God talks to us about HIS LORDSHIP, which many, many times we forget." "Adam and Eve were given authority until the fall." "Adam was created in God's image(the first Adam), and God's likeness. However, when Adam sinned, he lost Christ(the second Adam) image and likeness, and the spirit died. Remember? Once a person is born again, they will get it back. Otherwise, we are born of man and have man's image, likeness, and spirit. Read your Bible! God Bless!" "Ahhh I see that age old debate of whether God was talking to male or both as men and women could be had. but Thank God for free will and choices everyone has the right to believe either way." "Am an image and in the likeness of God"
"Amen! One of my FAVORITE scriptures. Thank you Father for YOUR "LOVING IMAGE" <3"
"AMEN! OVER EVERYTHING..I <3 GOD!" "And ESPECIALLY over themselves. Wherever they fall at, I would presume." "And just look at how the EVIL people have paid him back.It really make's me mad to know that this many people in this blessed conntry have turned their back's on GOD." "And letteth microbes have dominion over man"
"And man got exceedingly greedy with the dominion, and now we are in the end of days again." "And some idiots think we come from monkeys!!!!!!!!!!!!!!" "And we need to remind ourselves that we have dominion over satan and are kingdom saints!" "Bad mistake putting Man in charge"
"Colossians 2:9.. For in him dwells all fullness of the Godhead bodily." "Devan I really hope you read this. Jesus was not just an earthly being. This vs you commented on is the first peace of evidence that He was there at the beginning. God wasn't talking to himself when He said let US make man in OUR image. Another way to show you're wrong is found during his birth. Matthew 2:2 Saying; Where is he that is born King of the Jews? for we have seen his star in the east, and are come to worship him." "Dominion : supreme authority, governed territory (Webster's dictionary)"
"Dominion does not mean cruelty as some "so called" Christians exhibit." "Everything was spoke into existence before the 6th day,then came animals and then man. Does it bother you that we had to share the 6th day with the animals? Just thinking....."
"Ezekiiel 5 : "....for I know the things that come into your mind, every one of them. " 11. 11 : 8 " Ye have feared the sword : and I will bring a sword upon you, saith the Lord God.......12.....And ye shall know that I the Lord, for ye have NOT walked in my statutes, neither executed my judgements, but have done after the manners of the heathen that are round about you. "" "Father,pls give me the power and grace to dominate in all areas of my life in Jesus name.Amen"
"First mention of the triune God :o)"
"For faith cometh by hearing, hearing from the word of God"
"Genesis 1:26 - At sinabi ng Dios, Lalangin natin ang tao sa ating larawan, ayon sa ating wangis: at magkaroon sila ng kapangyarihan sa mga isda sa dagat, at sa mga ibon sa himpapawid, at sa mga hayop, at sa buong lupa, at sa bawa't umuusad, na nagsisiusad sa ibabaw ng lupa." "Glory to God Almighty my greatest provider and creator....Amen"
"Glory, I dominate, i rule my world in Christ Jesus who strenghten me.HALELUJAH Amen"
"GOD is a triune. Which means 3 in 1 GOD the Father GOD the Son (Matthew 1:23) GOD the Holy Spirit. ...So the "our image" We are triune beings... Mind, Body and Soul. He put man in charge of maintenance...basically." "God is not triune. God was speaking in his plural of majesty. The first of all the commandments is Deaut 6:4 Hear O Israel The Lord our God is one." "God is unlike anything we ever knew.that's why we call him God"
"God was speaking to Jesus and the Holy Spirit"
"God's idea for man kind was to rule over everything in this world and thanks to Jesus Christ and his perfect sacrifice on the cross now we can full fill once again our destiny ... Let's take back what belong to us !!! In the name if Jesus"
"Good stuff thanx Pastor Rick martin!!! Blessings to ur family!!!" "Good to animals, or God will Judge you." "Haha...I thought that sounded a bit weird too Virgil Power. Sounds different to the version I've read." "He also said "Let there be Peace""
"''HE Freely Gave us 'Power' OVER EVERYTHING . . . and What have we DONE with it?????'' :'("
"Hmmmm? Human is like God? i thought god must be far superior to humans in every aspect.....im confused." "I love this, how the Father is talking to Jesus, instructing him in creating all things." "I Thank God 4 that. N i believe in Him. AMEN." "I would point out that God is saying "let US make man in our image." He wasn't talking to the angels, because his creations cannot create from nothing, only he can. Just evidence that even the oldest of scripture speaks of the Godhead." "In thinking that we were made in god's image I was thinking of a beautiful song with the lyrics I can only imagine. Thinking what it would be like to meet God then you have to think what it would be like when God meets us, what would he say as he walk down the street"
"Isaiah 1 : 19 : " IF you be willing and obedient,, you shall eat the good of the land. "" "Isaiah 44:24 Thus saith the LORD, thy redeemer, and he that formed thee from the womb, I am the LORD that maketh all things; that stretcheth forth the heavens alone; that spreadeth abroad the earth by myself;"
"It was always interesting to me,that it say's 'in 'OUR' image',and not 'in MY image'.And I think that we can find the same example at 'DAVID'S PSALMS'!! !Also,I have read the Bible in 3 languages,so this is certanly not a coincidence,but it certanly has a precise meaning.That's my opinion. :)"
"James 2:9 Thou believest that there is one God;thou doest well:the devils also believe,and tremble." "Kunjimoan... i like this part very much>> AFTER OUR LIKNESS AND THEN LET THEM HAVE DOMINION OVER EVERYTHING. So we have to get in his likeness (innerman like jesus)"
"Let me get this straight� God said "�make man in OUR image" who else is included in that? i interpret "our" to imply "US" is there more than one god? or is he breaking one of the 10 commandments?" "Let me tell you who Jesus is... 1 Timothy 3:16 And without controversy great is the mystery of godliness: God was manifest in the flesh, justified in the Spirit, seen of angels, preached unto the Gentiles, believed on in the world, received up into glory." "Let us not forget!And give God the thanks!" "Lord God i tank u 4 putn me incharge over everthn under heaven accordn 2 ur word in Genesis." "Lord let your covenant between man and you to continue and forgive us our sins. AMEN"
"Lord, I am sorry we have messed up EVERYTHING that You intrusted to us." "Manu Nsampolu yes! Amen :p"
"Nehemiah 9:6 Thou, even thou, art LORD alone; thou hast made heaven, the heaven of heavens, with all their host, the earth, and all things that are therein, the seas, and all that is therein, and thou preservest them all; and the host of heaven worshippeth thee." "No carlos it was not meaning many godly beings he was basically lettn us know jesus was with him before he even came. Because Jesus IS GOD. There are three beings in the 1.god, Father ( God) SON ( jesus) and The Holy Spirit (Jesus ressurected " he is god" )"
"Notice it says "after OUR image, after OUR likeness" telling you there was more than one entity in the beginning. You can precept this with John 1 where the Messiah was the first spirit the Most High made in the heavens. The Holy Spirit/wisdom is a feminine spirit. That's why we have MAN AND WOMAN..."
"Oh, how I wish people live what God said they were. Amen"
"Ok again did you notice that God created the whole earth and everything in it for His "man" a nursery was all prepared for Adam. God created a grown up earth( ready to live in) and a grown up man to live there. Also note they were all vegetarians." "Only One God did this not Two, or Three, just One God. No Trinity"
"Our image? Hope this answers your question. 1 john 5:7 For there are three that bear record in heaven the father, the Word, and the Holy Ghost: and this three are one. 1 john 5:7 David Thomas Corbin, Joel Haynes"
"Our means the Trinity, Father, Son and Holy Ghost." "OVER THE FOWL OF THE AIR.THE ENEMY IS ALREADY DEFEATED.SOMETIME IT'S THE FLESH AND THE WORLD THAT WE FIGHT.NOT DEMONS.BE BLESSED!" "People these are the things God gave us dominion over. Everything else God have control over." "Praise the mighty name of God." "Sad the seas are polluted and so is the air we breathe. The cattle are injected with dangerous medicines for production and our earth is being injected with chemicals to alter the production rate. Our vegetables are contaminated with insecticides and GMO's. God forgive us and protect us, have mercy upon us for so callously abusing the gifts you gave." "So God made man in HIS singular image. 2 Cor 4:4 Christ is the image of God"
"SPIRITUAL BEINGS IN HEAVEN ...or i can say aliens in space -LOL"
"That's why all living things and all human being are breathing and living with the grace of God our creator..hallelujah. .Amen"
"The Bible declares that God exists and He made man in his image. And so, atheists and free thinkers have their bubbles burst, with these revelations." "The first doctrine of the trinity!!!" "The Lord doesn't regret creating us, if He did He never would have paid our sin debt. O,HOW HE LOVES US SO MUCH MORE THAN WE CAN EVER IMAGINE." "The only way you be in image and likeness is by the spirit and the word." "The word of GOD is more than powerful!!!!" "Think about it... God made us in HIS Image after HIS likeness." "This is the one I was trying to think of the other day.Ty.God Bless"
"This is why I can smash spiders in my house with no guilt." "This verse is the CLUE to Jesus..when God says "us" and "our" ..who do you think He is referring to?" "To see when man began to eat meat ...Gen 9:2,3. This is a fun study." "We are children of the most high God, How much we reflect his Image is in our hands~~~~~~~~"
"We need to go back to BIBLE BASICS"
"We r created wth hs liknss"
"We still have dominion over the fish of the sea, and over the fowl of the air, and over the cattle, and over all the earth, and over every creeping thing that creepeth upon the earth." "Wow did man ever mess that up"
"YAY! One of my FAVORITE SCRIPTURES! <3"
"Yes, then Adam lost it when he put his own personal choice above God's Lordship." "You are exactly right Carlos !!!" "YOU ARE NOT CREATED FOR NEGOTIATION BUT FOR DOMINION." "You cannot truly worship God if you do not know Him"